Support Richmond Promise college students! Become a mentor! Time commitment one hour a month for at least a year beginning December 2018. Fill out an interest form at www.tinyurl.com/richmentor. Last, this year's scholarship is opening on October 1! 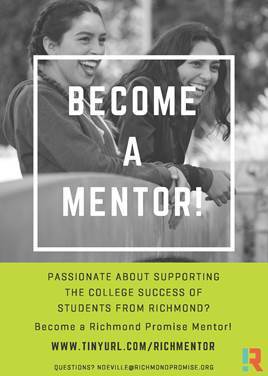 We are having a scholarship launch on October 1 to help students and families get started on their financial aid and Richmond Promise Scholarship applications. Students can RSVP for the launch event at rpscholarshiplaunch.eventbrite.com. If you know of any eligible students, please spread the word. Support the Promise while you shop! Love the Oakland A's? Support the Promise when you purchase a ticket!